In a contrast to the formal statement made by the Muslim Brotherhood condemning the Boston bombing, Essam el-Erian, the vice chairman of the Muslim Brotherhood’s Freedom and Justice party, sparked widespread controversy when he posted a long comment on Facebook, later translated into English, in which he connected the twin blasts in Boston to an alleged anti-Muslim conspiracy that spans the globe. He also linked the bombings to the French military action in Mali, the conflict in Syria, and what he described as the “faltering” peace process between Turkey and the rebels in the Kurdish Workers Party (PKK). He then asked, “Who planted Islamophobia through research, the press, and the media? …Who funded the violence?” The Arab and Muslim worlds have a long history of indulging in conspiracy theories theories, most of which revolve around the West, Israel, and Zionism plotting against the Arabs. Islamist movements including the Muslim Brotherhood have consistently used conspiracy as a means to justify their views and political stance. I vividly remember when a Brotherhood affiliate explained to me that the Brotherhood’s leader, Sayyed Qutb, has witnessed ordinary Americans “celebrating the death of the Brotherhood’s founder, Hassan al-Banna.” Even as a teenager, I found his story implausible; why would ordinary Americans, during the pre-television era, have heard about Banna, let alone celebrate his death? This is also not the first of such a claim from el-Erian, who has a record of controversial statements that are full of implicit or explicit accusations. Last January, he accused all media, except Al Jazeera, of serving the former regime. In a recent tweet, Erian bizarrely linked “Jewish Passover with pilgrimage to Dubai and devilish inspirations.” It is unclear what he meant; he could have been alluding to the recent visit from ElBaradei or to Shafiq’s residency in the Gulf state known for its tense relationship with the Brotherhood. He also accused opposition figure El-Baradei of “facilitating the US invasion of Iraq.” Conspiracy has been linked to the core ideology of the Brotherhood since the assassination of its leader, Hassan el-Banna, an incident that enriched its members’ belief that the Muslim “Ummah” is always vulnerable to plots from the enemies of Islam. Gradually, conspiracy became a crucial pillar of the Brotherhood defense, and counter-attack when accused of wrongdoing. The Muslim Brotherhood, despite many reliable testimonies, has consistently denied any role in the Cairo fire in 1952 or in attacking or harassing the Jewish community in Egypt. Its members also vehemently denied plotting against Nasser or forging any deals with Mubarak. They brush aside these accusations as part of the ongoing conspiracy against them, and of course, in a country like Egypt, where historical events are blended with propaganda, it is hard to collect concrete evidences to incriminate or vindicate the Brotherhood. 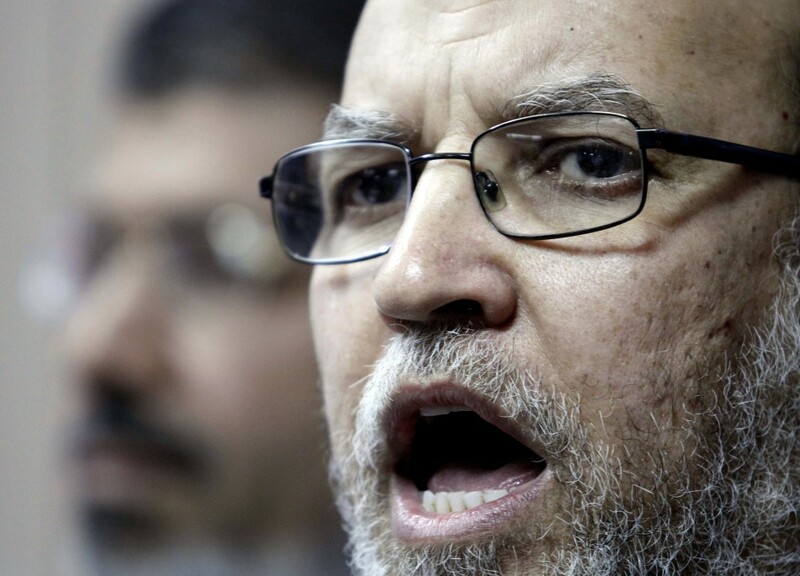 Moreover, following its ascendancy to power after the January 2011 revolution, the Muslim Brotherhood has opted to use a two-faced rhetoric that varies considerably in language and tone between its Arabic and English versions, with more blunt statements full of hints and accusations in Arabic in contrast to the balanced, carefully crafted English statements. This policy was initially successful, with many analysts and observers embracing the English statements as the true reflection of the group’s moderate stance. However, recently, the Brotherhood’s dismal performance has prompted a closer scrutiny of its Arabic statements, with new emerging translations by the web site, “mbinenglish ,” which reveals hypocritical views and outlandish accusations. In one example, the Arabic freedom and Justice portal claimed that, “The events of the Coptic Cathedral began after the Egyptian opposition figure Abu Hamed met with Lebanese Christian militia leader Samir Gaegea.” In addition, pro-Brotherhood sites among the social media are full of lavish accusations against opposition figures, with allegations of Sabahi funded by Iran, El-Baradei funded by the United Arab Emirates, and the black Bloc led by Copts − the list of plots that aim to ruin the Brotherhood role in Egypt is endless. However, el-Erian’s Boston statement reveals a more sinister version of a conspiracy theory that rejects the existence of radical Muslim groups and their involvement in terror. The Brotherhood vehemently rejects the French interference in Mali and refuses to acknowledge the savage, grotesque behavior of its members and how they abused Sharia to justify their torture and destruction. In Syria, the brotherhood kept quiet when the radical group al-Nusra pledged allegiance to al-Qaeda. Even in Egypt, the Brotherhood is not confronting radical groups that turned Sinai into a lawless frontier. The Brotherhood, which consistently claims that it is the flag holder of “moderate Islam,” has yet to define terrorism or acknowledge that some Islamic groups use terror as a tool of their “resistance.” Now, el-Erian goes even further, hinting that some outside forces have infiltrated and are financing radical groups and encouraging them to commit savage acts of terror that tarnish Islam and Muslims. El-Erian‘s statement should not come as a surprise to anyone; the group’s makeover in recent years has proven to be only skin deep. Its recent mediocre performance, together with its odd statements, underscores the group’s immaturity, the inability of its members to accept responsibility for their own actions, and its twisted version of Islam. Unfortunately for el-Erian, the Arab awakening has aided the rise of many reform Muslims that reject the Islamists’ shameless use of religion in politics and has also rejected the justification of terror under any conspiracy theory. Regardless of who is behind the blasts in Boston, Islam as a faith will not be affected; in fact, the opposite is true, as the vast majority of Muslims in their stand against terror reject conspiracy theories, whether el-Erian likes it or not. This entry was posted in Egypt and tagged Boston, Boston Marathon, Conspiracy theories, Essam el-Erian, Muslim Brotherhood. Bookmark the permalink. To come up with so many fanciful thoughts – he must have a team of writers as other comedians do – you think?